On 15 October 1904, the Second Pacific Squadron (Formerly the Baltic Fleet) finally set sail from the Baltic and headed toward their comrades at Port Arthur, it would be May 1905 before they finally arrived. Coal-fired warships were not designed for 18,000-mile journeys without the benefit of extensive dockyard facilities along the way. Their reciprocating engines pounded themselves to pieces over long periods of time, unless run at their slowest speeds, and were prone to breakdowns. Their steam boilers needed frequent cleaning that made the heat of the tropics, especially for the Russian crewman, an unbearable hell. After nearly superhuman effort and an unprecedented voyage of 18,000 miles around the world from the Baltic, the now Vice Admiral Zinovi Petrovitch Rozhdestvenski, by May 1905 was steaming through the South China Sea. The Third Pacific Squadron, under the command of Rear Admiral Nikolai Nebogatov, had joined Rozhdestvenski’s fleet that month. With Port Arthur now in Japanese hands the only remaining Russian port in the region was Vladivostok. 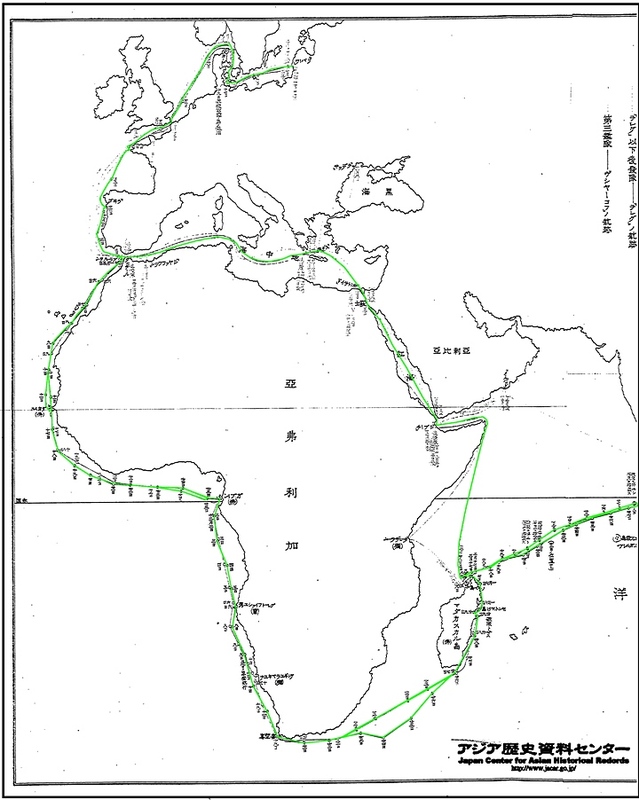 There were three possible routes that Rozhdestvenski could take, all through relatively narrow straits. The first two, La Perouse and Tsugaru, were at the northern end of the Japanese home islands. A voyage through them meant steaming up the east coast of Japan, and would require another coaling at sea, all the while vulnerable to attack. The third alternative, the Tsushima Strait, would lead his fleet through the heart of the Japanese controlled seas. With the condition of his fleet and the need to make Vladivostok before his coal was gone, Rozhdestvenski made the only choice he could. Tsushima Strait would have to be his chosen route. The images above are of Japanese Naval Charts of the world in which the daily movements of Russia’s Baltic Fleet were plotted. The path was highlighted in green by the webmaster. Notice the dates of each location drawn in Kanji. Komura Jutaro who was instrumental in the annexation of Dokdo was telegraphed the Baltic Fleet’s location regularly during the infamous voyage. The fleets converged on the afternoon of May 27, 1905. The first ship to open fire was Admiral Rozhestvensky’s flag battleship Knyaz Suvorov. Three minutes later, under the flag of Admiral Togo, (shown to the right) the battleship Mikasa fired back. During the first forty minutes, the Japanese showered the battleships Knyaz Suvorov and Oslyabya with high-explosive shells, whereupon the Oslyabya sank with its commander, Captain Vladimir Ber, and the majority of its crew. Admiral Rozhestvensky was wounded, and the control of the squadron was disorganized. The commanders of the battleships Emperor Alexander III and Borodino, The Alexander, Borodino and then the other battleships came under the lateral fire of the Japanese. However, by 16:00 hours Admiral Togo had lost sight of the Russian ships in the mist and smoke. While travelling northwards, the squadron was overtaken by the battleships of Admiral Togo. The Emperor Alexander III and Borodino were lost just before dusk in the ensuing battle, and, almost simultaneously, the Knyaz Suvorov began sinking after being hit by Japanese torpedoes. Late in the evening, aboard the Emperor Nicholas I, Rear Admiral Nebogatov took command of the squadron. Admiral Togo ceased firing and ordered his destroyers to rush in and attack the Russian ships at close range. The battleship Sysoy Veliky along with the cruisers Admiral Nakhimov and Vladimir Monomakh, exploded. Three other ships tried to head for Tsushima but were so badly damaged that they were scuttled by their crews on the morning of May 28th. The Navarin (shown to the left) was blown up by floating mines and sank as well. Under Captain Iosif Matusevich, the crew of the destroyer Bezuprechny, the Russian ship was then lost with all aboard. The damaged cruiser Svetlana fought several Japanese cruisers. Having fired all their shells, the sailors of the Svetlana opened the ship’s kingston valves. The Japanese ordered the Admiral Ushakov, of the Russian battleship to surrender, and the Russians answered the Japanese with gunfire. Within an hour, the Admiral Ushakov sank under St. Andrew’s ensign. In the battle with two Japanese des-troyers, the destroyer Gronky, under Commander Georgy Kern, sank with her colours flying. The last ship to break off the fight the Navy-the cruiser Dmitry Donskoy. On the evening of May 27th, her crew withstood a fierce battle against six Japanese cruisers. On the morning of May 28th the badly damaged ship was scuttled, following the orders of the senior officer, Commander Konstantin Blokhin, who had replaced the mortally wounded Captain Ivan Lebedev. 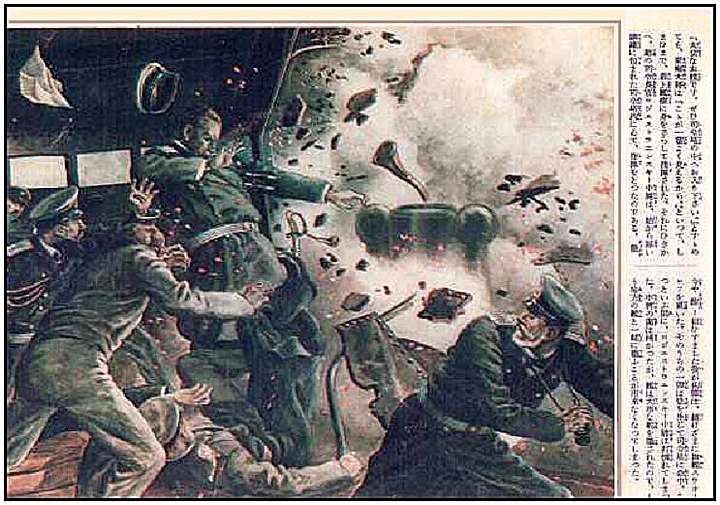 In the artist’s rendering above left, the Russian Admiral Rozhestvensky’s flag battleship Knyaz Suvorov takes a direct hit from the Japanese in the early stages of the Battle of Tsushima. Admiral Rozhestvensky was wounded in the head by a shell fragment, he was transferred to a destroyer that was eventually captured. Rozhestvensky was then taken prisoner by the Japanese navy. 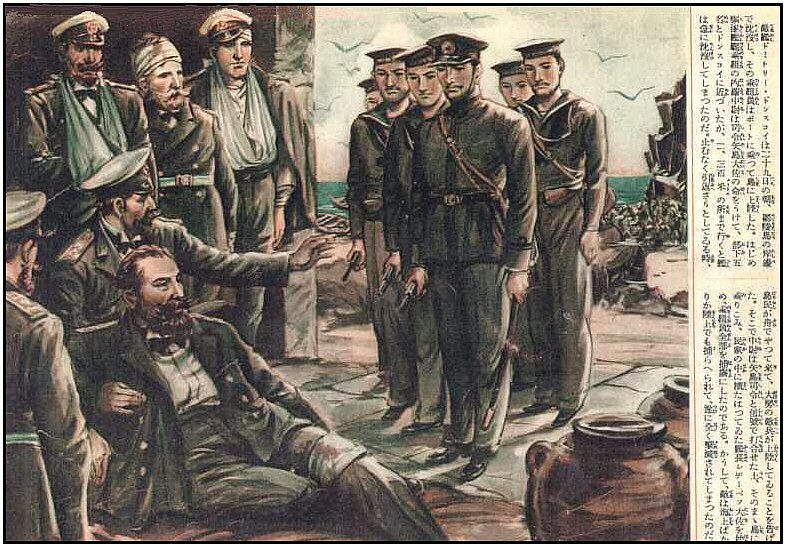 In the image above right, the wounded captain Lebedev of the Dmitiri Donskoi surrenders to the Japanese on Ulleungdo Island. His crew scuttled the ship earlier rather than have the ship taken away and used again under the Japanese flag as some other vessels were. Above left: The Svetlana above fought to the bitter end and refused to hoist the flag of surrender. Bathed in a shower of shellfire, the crew waited for the ship to sink. The captain was killed, the commander mortally wounded, the ship gradually keeled over and most of the crew jumped into the sea. Above right: A photograph of the Dimitri Donskoi. The gunners in the Russian Fleet had in most cases been at their guns for twenty-four hours, and for about six hours had been engaged in one of the fiercest naval battles in history. Admiral Togo on the other hand was able to rest the crews of his heavy ships as they steamed north at 15 knots toward the fleet rendezvous just north of Ulleungdo. Togo steamed all night till he was about 30 miles southeast of Ulleungdo at daybreak. Almost at once, he received a wireless report from the Sixth Division that a group of Russian vessels had been discovered almost sixty miles further to the south, going north. Rear Admiral Nebogatov realized that his sluggish hulks could not have escaped from Togo’s rapidly approaching forces. So he did not even try. He then estimated almost all of his 2000 men would drown were he to scuttle his ships. Nebogatov could not order such a meaningless sacrifice of the lives of his men. Nebogatov ordered XGH, the international signal for surrender, to be hoisted on the yardarm Southwest of Dokdo Islands. 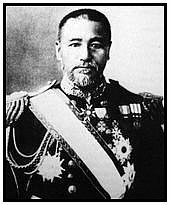 When Admiral Togo was satisfied that no trick was being attempted, he order his fleet to cease firing and dispatched a detail of officers and men to transfer prisoners and take over the prizes. Following the Tsushima calamity, Russia tallied its heavy losses: 5,045 Russian sailors were killed and 6,106 taken prisoner. Victory cost the Japanese three destroyers as well as 699 officers and sailors. After the battle of May 27-28, the government of Nicholas II agreed to peace negotiations. According to the Portsmouth Treaty of 23 August 1905, Japan was given the Kwantung Peninsula along with Port Arthur and the southern part of Sakhalin Island up to the 50th parallel. The picture above shows the Russian Navy after Rear Admiral surrendered South of Dokdo Island. This historic event made Takeshima Island well-known to Japanese citizens upon hearing the name through newpaper reports. The Nikolai I ( was scuttled by her crew near Dokdo Island to avoid capture. The Russo-Japanese War was the first global conflict of the modern era and the first war in which an emerging Asian nation defeated a European great power. The Japanese victory inflamed Asian nationalism and contributed to the struggle against colonialism throughout the region. The military debacle exposed the weakness of the tsarist regime and is usually considered the prime cause of the Revolution of 1905. After the complete defeat of Russia’s land and naval forces, the tsar sued for peace. U.S. president Theodore Roosevelt brokered the Treaty of Portsmouth (August 23, 1905), but the Japanese believed that they had lost the peace and did not trust Western diplomacy again until after World War Two. 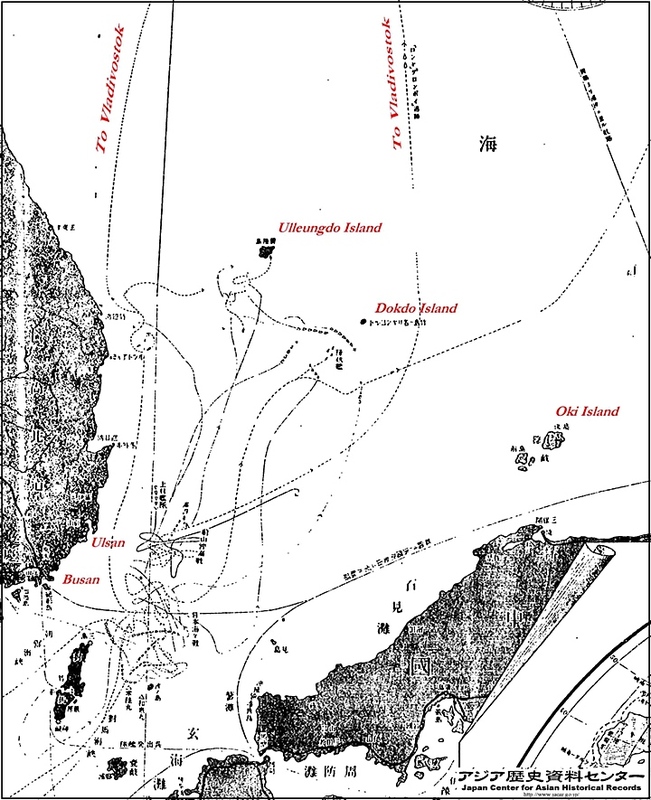 The Japanese Navy drafted a plan on May 30 immediately following the sea battle, and on June 13, 1905, instructed the warship Hashitade to go to Dokdo Island for a further detailed survey. The Navy thus setup a plan for comprehensive facilities in the Sea of Japan (East Sea) including Ullungdo and Dokdo on June 24 of the same year. 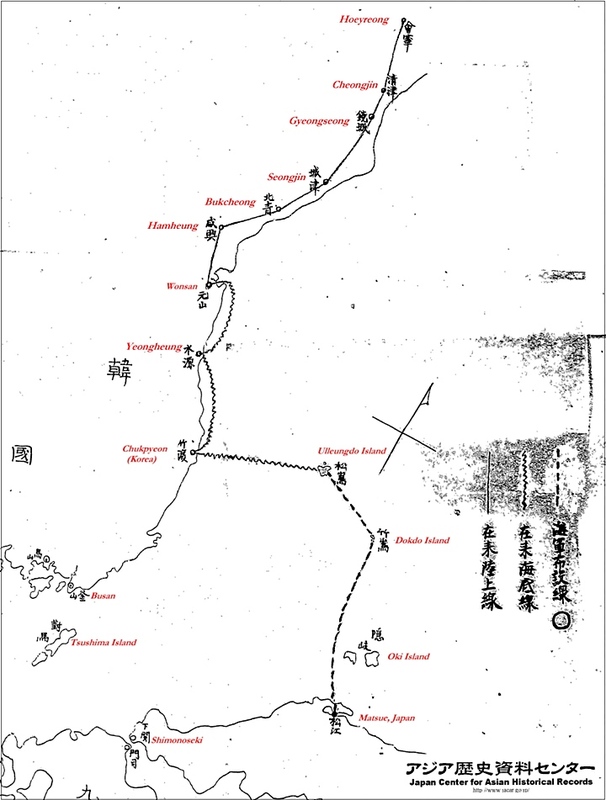 The plan called for (1) the construction of a large watchtower on the northern part of Ullungdo (nine men to be posted) and a wireless telegraphic station, (2) the construction of the long-pending watchtower on Dokdo (to be manned by four men), (3) the watchtowers of the two islands to be linked by submarine cables which are to be extended to the watch- tower on Oki Island. These were illegal military facilities without regard to national boundaries. The construction of the new watchtower on Ullungdo started on July 14, 1905, and was completed on August 16, while that on Dokdo began on July 25 and completed on August 19. 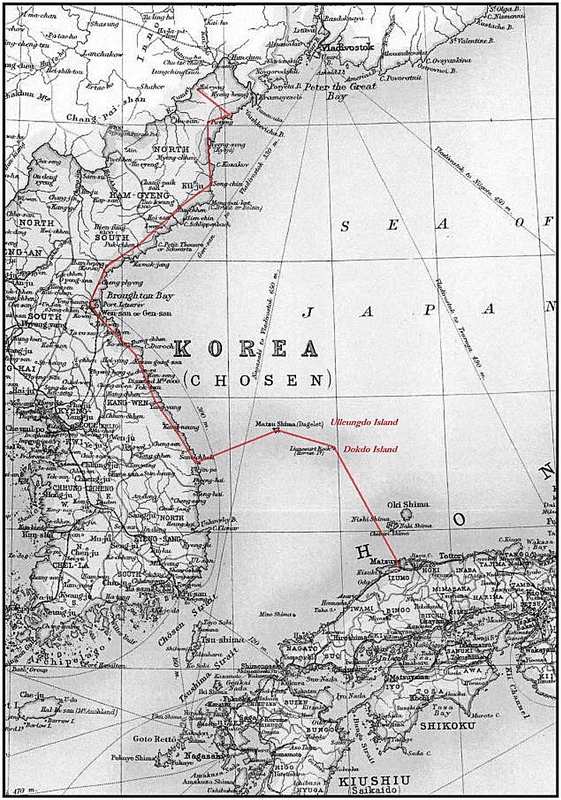 The original plan to link Dokdo with Oki Island by sub- marine cables were changed when the peace treaty with Russia was concluded in September 1905, and instead the line was set up between Dokdo and Matsue. This work was started at the end of October 1905, and a link from Ullungdo to Matsue via Dokdo was completed on November 9 of the same year. Japan Naval General Staff. Consequently in 1905, a network of military communication lines were completed from the Korean mainland-Chukpyeon to Ullungdo, Dokdo, and Matsue. The map on the left illustrates another stage of Japan’s militarization of the East Sea (Sea of Japan) The Dokdo ~ Matsue submarine line ensured that Japan could maintain control and monitor all acitivities in the region. 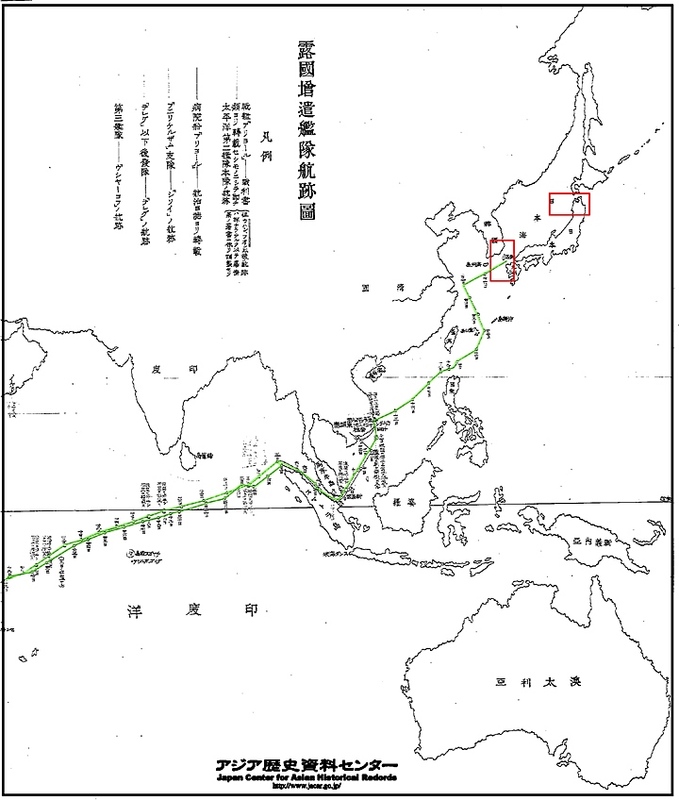 The green line represents the first stage of Japanese Naval telegraph lines and the blue line illustrates the Dokdo~Matsue line which design was hastily planned immediately after the Battle of Tsushima. In short, for the Japanese government, Takeshima/Dokdo was nothing more than an object of military value, and it was closely related to and inseparable from military occupation of various parts of Korea at that time. Above this text (left) is also a map from the Japan Center of Asian Historical Records. It is dated between October and November of 1905. The red text was added to give geographic location to the original map. The map was also slightly cropped to reduce the image file size. The map to the above right gives perspective as to where these telegraph lines extended.It is clear these lines were for the purpose of monitoring Korean border and coastal areas as well as the naval activities of Vladivostok Harbour about 200kms to the Northwest. February 8, 1904 Japan Declares War against Russia and launches attack in Incheon, Korea and Port Arthur sinking Russian ships. Japanese troops advance into Seoul. February 16, 1904 The Japanese begin occupying Korea in force, the Japanese 12th Division lands at Incheon, Japanese troops begin advancing north toward the Yalu – the First Japanese Army is organized. February 23, 1904 Japan coerces Korea into signing the Japan~Korea protocol allowing Japan to “legally” appropriate Korean land for military purposes. Late March 1904 Reporting from Korea, Japanese envoy Hayashi recommends that Japan install a minister with broad powers and urges the imposition of fiscal reform, economic concessions, and permanent military bases. 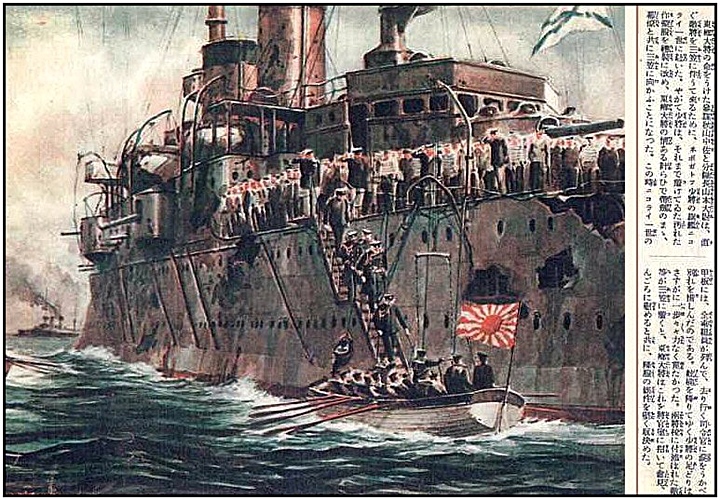 April 26, 1904 After the Russian Navy sinks a Japanese troop transport, every single Japanese soldier goes down with the ship rather than surrender. May 19, 1904 Korea finally breaks relations and abrogates its treaties with Russia. 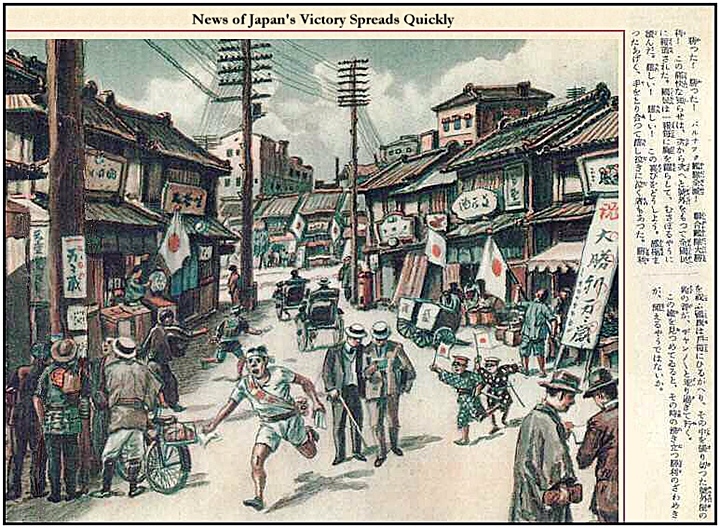 May 31, 1904 The Japanese cabinet adopts plans to control Korean foreign policy, military, police, finances, communications, and transportation – vague plans are formulated for Japanese migration to Korea and for exploitation of its resources. Early August 1904 The Korean court agrees to appoint pro-Japanese advisors on financial and foreign affairs. The Korean currency is reformed, securing Japanese financial hegemony. 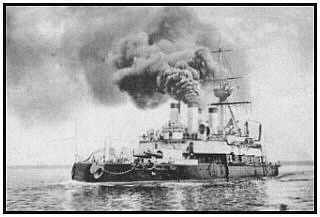 August 14, 1904 The Japanese Navy defeats the Russians off the Korean coast in the battle of Ulsan. 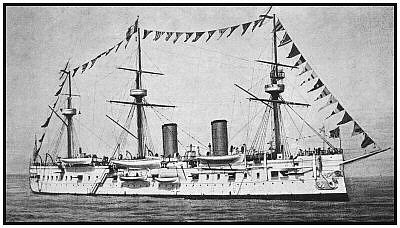 September 25, 1904 The Japanese Navy completes the Ulleungdo Island~Sasebo Naval Base, Japan submarine telegraph line. 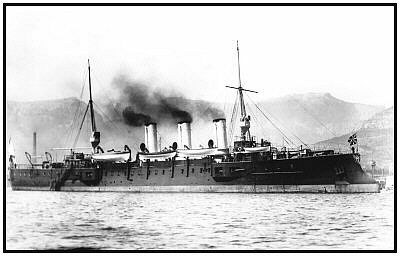 November 20, 1904 The Japanese Warship Tsushima inspects Dokdo Island and confirms the topography of Dokdo Island is suitable for a military watchtower with submarine telegraph cables to be built on the East Islet. January 5, 1905 The Survey Report of Liancourt Rocks by the Warship Tsushima is submitted to the Japanese Navy’s Hydrographic Department Director, Admiral Kimotsuki. January 28, 1905 In a closed cabinet meeting, Shimane Prefecture decides to “incorporate” Dokdo and name the island Takeshima. February 20, 1905 The Battle of Mukden (Shenyang) begins, it is the largest land battle fought to the date with over 500,000 Russian and Japanese troops involved and over 150,000 killed or wounded. February 22, 1905 Shimane Prefecture annexes Dokdo Island as part of Japanese territory. April 1905 The Japanese cabinet decides to impose a protectorate on Korea in the near future. 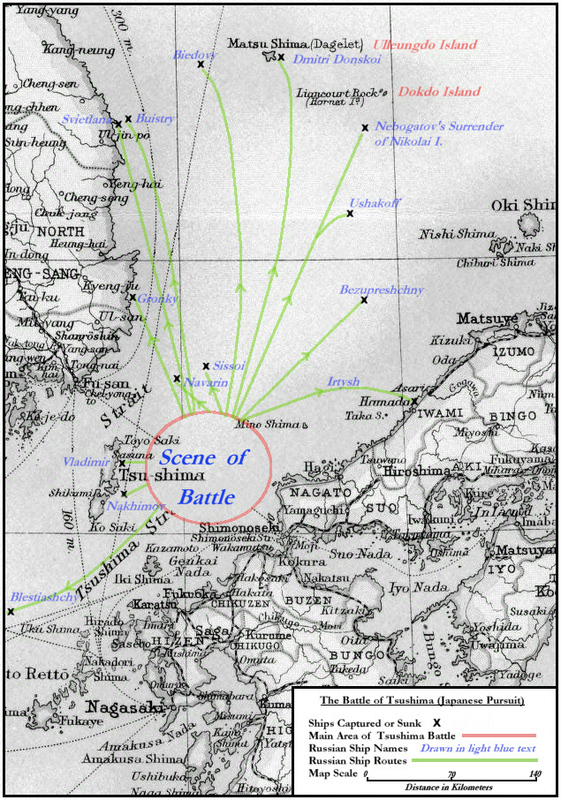 May 27~29, 1905 The Battle of Tsushima is fought in the East Sea (Sea of Japan) It is the largest naval battle ever fought to date. Over 5,000 Russians are killed and 6,000 Russians taken prisioner. Japan loses three destoyers and about 600 officers and sailors. The Russian Navy is destroyed and Japan clearly becomes a world power. 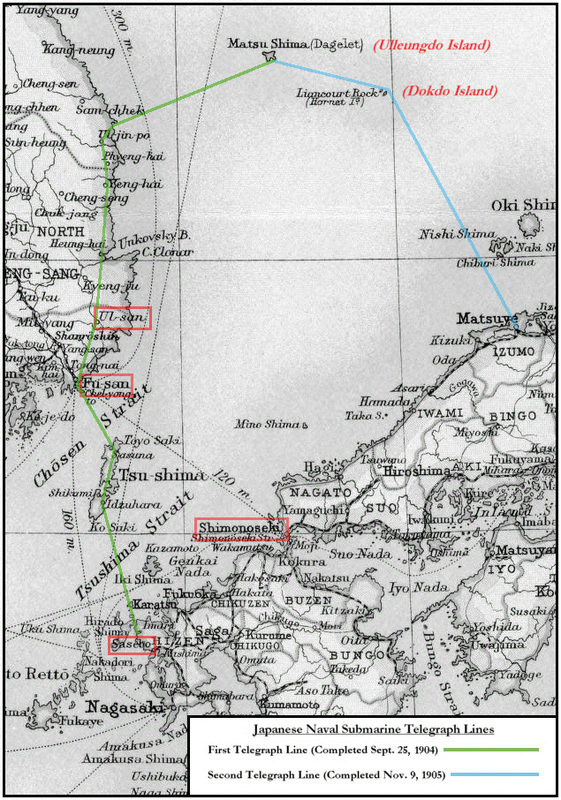 May 30, 1905 The Japanese Navy drafts final plans for new watchtowers and submarine cables to be built and installed on Ulleungdo and Dokdo Islands. June 8, 1905 America officially offers to host peace talks between Japan and Russia and by June 12, both countries formally accept negotiations. 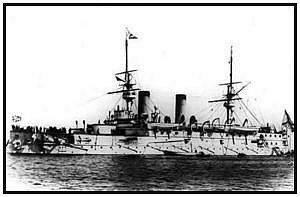 June 24, 1905 The Japanese warship Hashitade inspects Dokdo Island. July 14, 1905 Japanese Navy begins contruction of Ulleungdo and Dokdo watchtowers and telegraph lines. July 29, 1905 The secret Taft-Katsura Agreement America recognizes Japanese predominance in Korea in return for a Japanese pledge not to interfere in the Philippines. August 12, 1905 The Anglo-Japanese alliance is renewed and expanded to provide mutual support if either is attacked by a single power instead of two and is extended to India – Britain recognizes the Japanese dominance of Korea in return for a Japanese pledge not to threaten British interest in India and Burma. September 5, 1905 The Treaty of Porstmouth Ends the Russo~Japanese War: Russia recognizes Japanese control of Korea, the Liaotung Peninsula, southern Sakhalin Island, and the southern Manchurian rail system. November 9, 1905 Japanese Navy completes Ulleungdo and Dokdo Islands’ watchtowers and submarine telegraph cable lines. November 17, 1905 Japan imposes a protectorate on Korea via the coerced Japan~Korea Protectorate Treaty. The Japanese Foreign Ministry asserts on their website that Shimane Prefecture simply incorporated Dokdo and to this day insists this acquisition was legal. However, only through the ignorance of historical facts during the Russo~Japanese War can this view be accepted. When studying the events of 1904~1905 it’s obvious the Russo~Japanese War played a critical role in Japan’s decision to annex Dokdo Island. The Japanese incorporated Dokdo only two days after the start of the largest land battle in world history to the day called the Battle of Mukden (Shenyang, China). The Japanese Imperial Navy was posturing for Russia’s advancing Baltic Naval Fleet rapidly approaching the East Sea (Sea of Japan) that was around Madagascar in February 1905. The confrontation between the Baltic Fleet and the Japanese Navy would result in the largest naval battle in history up to that day and would take place in the waters near both Ulleungdo and Dokdo. The Japanese Foreign Ministry is making a grave error when glossing over the circumstances surrounding their involvement in Korea at this time.